A dream comes true for a little girl who loves tutus, pointe shoes, and dancing on tiptoe! This little dancer loves to swirl and twirl and leap. She practices new steps every day. All her efforts are rewarded when one special day, she gets to dance in a performance with her favorite ballerina. "Dear Ballerina," the girl writes, "I dream of being a dancer just like you." Behind-the-scenes in a practice room, a costume room, and the wings of the stage, secrets are revealed! At last, the curtain goes up, and the girl and her idol perform in the same ballet. Their tutus swirl together! A touching story about dance, passion, effort, and intergenerational mentorship. Monica Wellington is the mother of a little girl who has grown up to be a professional ballerina with New York City Ballet. This book was inspired by letters Lydia Wellington wrote to dancers she admired, as well as letters she now receives from young fans. 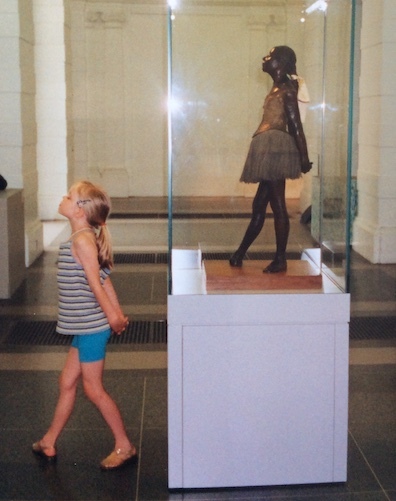 My daughter when she little - with Marie, The Little Dancer, by Edgar Degas. And now grown-up! I am backstage with her just moments before the ballet was about to begin. Young dancers often write letters to ballerinas they admire, and hope for a pair of their pointe shoes in return! My daughter wrote letters like these when she was a young student and now she loves receiving them. This tradition inspired the idea for Dear Ballerina. Going backstage at New York City Ballet during Nutcracker and Sleeping Beauty was a dream come true for DEAR BALLERINA’s little dancer!